These 2 bridges were ultra quick builds for M>ltc’s last layout. The first is a sandstone road bridge, to provide a link for the country people to get to town. It is a simple arch bridge, with 2 traffic lanes, and footpaths on either side. It is very simple in construction, but surprisingly sturdy. 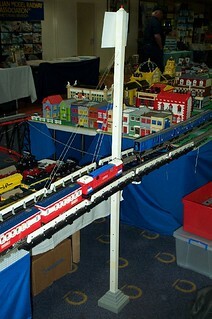 The second is a short trestle bridge, to carry the high level train line. The construction is fairly simple, except for the curves required at each end. They initially posed some problems, but they were solved with the help of Teunis, our artistic director. A third bridge was also constructed to carry the main lines across the river, but that was a much larger project, and will be documented fully in a subsequent article. It’s back! Better than ever! 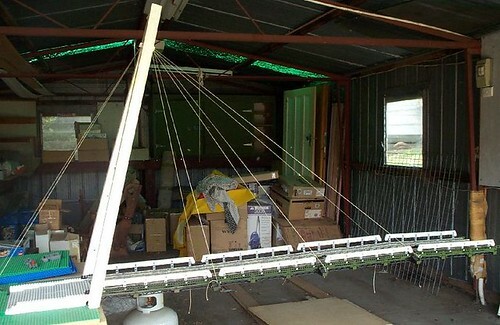 Duane Collicott is progressing on a nice looking cable-stayed bridge, you can read more about it here.